While many people are somewhat afraid of eating avocados because of their high fat content, research shows many health benefits being attributed to this wonderful fruit. Despite the dozens of varieties, the Haas avocado (Guatemalan) is the most popular avocado in the United States. The Hass avocado is purple-brown, pebbled, thick skin and oval in shape. Its prime season is during December. California produces about 80% of the U.S. avocado crop. Avocados are an excellent source of monounsaturated fatty acids, as well as potassium, vitamin E, and B vitamins and fiber. 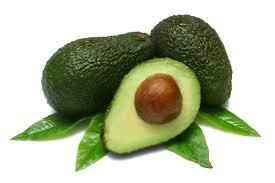 In fact, one avocado will have the potassium content of 2-to-3 bananas (about 1,000 mg of potassium). Of course, an avocado will also have about 3 times the calories as a banana. A 3-1/2 ounce (100g) serving is about ½ of an avocado and provides 160 calories, 2.0 g protein, 14.7 g fat, 8.5 carbohydrate and 6.7 g fiber. Avocado oil consists of 71% monounsaturated fatty acids (MUFA), 13% polyunsaturated fatty acids (PUFA), and 16% saturated fatty acids (SFA), which helps to promote healthy blood lipid profiles and enhance the bioavailability of fat-soluble vitamins and phytochemicals from the avocado or other fruits and vegetables. The consumption of avocados with salads or salsa increases the bioavailability of carotenoids multi-fold, which may add to the potential health benefits. In an excellent review article, the potential health benefits of the Haas avocado were highlighted. Of particular note are eight clinical trials showing cardiovascular benefits including improvements in cholesterol levels. The first clinical study on the effects of avocado consumption and cardiovascular health was conducted back in 1960 and it demonstrated that the consumption of 0.5–1.5 avocados per day helped to maintain normal serum total cholesterol in men. Half the subjects experienced a 9–43% reduction in serum total cholesterol. In the 1990s, additional clinical trials with avocado ingestion consistently showed positive effects on blood lipids in a wide variety of diets in studies on healthy, hypercholesterolemic, and type 2 diabetes subjects. In subjects with high blood cholesterol levels, avocado enriched diets improved blood lipid profiles by lowering LDL-cholesterol and triglycerides and increasing HDL-cholesterol compared to high carbohydrate diets or other diets without avocado. In people with normal blood cholesterol levels, avocado enriched diets improved lipid profiles by lowering LDL-cholesterol. Bottom line is that avocado is a very health promoting food that should be added to the diet, especially as an accompaniment to salads and salsa to increase the absorption of beneficial phytochemicals. My interest in avocado was piqued a bit recently by the availability of avocado oil at a major retailer. The price was exceptionally economical compared to olive oil and the smoke point is much higher for avocado oil. In cooking, the smoke point of an oil or fat is the temperature at which it begins to break down to glycerol and free fatty acids, and produce bluish smoke. The glycerol is then further broken down to acrolein – a rather toxic substance that is also extremely irritating to the eyes and throat. The smoke point of refined avocado oil is roughly 500 degrees F versus about 400 degrees F for extra virgin olive oil. Both are excellent sources of monounsaturated fat. Avocado oil may turn out to be a healthy and economical alternative to olive oil. I have been using it for the past month and really like it a lot. Give it a try.